When he discovers that his old friend Cal Hudson has betrayed Starfleet to join the Maquis, Commander Sisko must decide how best to balance his friendship against his duty to Starfleet and the Federation. Answer: Phasers! Pew pew pew!!! Matthew: I think this episode suffers from what a lot of second parts in Trek do, a general feeling of not totally paying off the promise of the first part. I don't think this is because there is anything wrong with the various plot beats, but the sum total ended up feeling a bit small and anticlimactic compared to the promise of the intro. Given what was on screen, the Maquis seemed like a very small movement, not worth all the sturm und drang it was afforded by the various factions in the story. 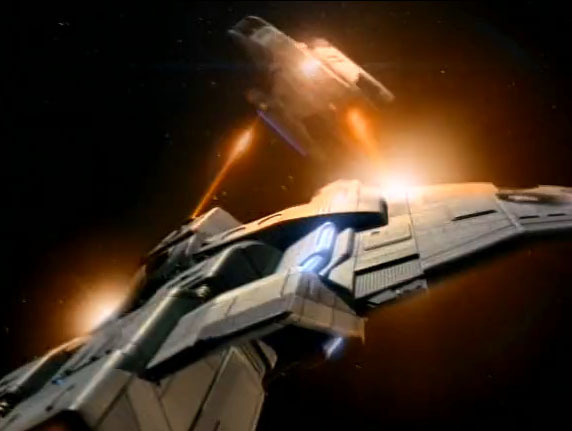 We only ever saw two ships, and a maximum of 4 or 5 extras on screen at a given time. Their plans for all their illegally procured weapons seemed a bit tame, and the threat to their livelihoods was only talked about in dialogue, never shown on screen. We saw almost no Cardassians beyond Gul Dukat and Legate Parn, which left their end of the conflict feeling under-developed. If they're so keen on preserving the treaty, why are they arming their colonies at all? It was all a bit abstract. Kevin: I think a few pieces of dialogue could have fixed most of these problems. It could have increased the size of Maquis operations. It also could have clarified who in Central Command was pushing for war. Maybe it's the same people who tried to arm the Circle earlier in the season. A rogue war hawk in the Cardassian government would be an entertaining problem. I mean if the Cardassian government was actually arming the colonists with the intent of provoking an armed Federation response, wouldn't that be a cause for war? The politics needed to be sharpened a little. Matthew: I have issues with Sisko's behavior in this episode. There were one too many "Sisko walks in on the Maquis hideout" scenes for my own personal credulity. Sisko withholds information from Admiral Nechayev, but then chastises Cal Hudson for abandoning his Starfleet ideals and principles. Um... hypocrisy much? Basically, by the end of things here, in having let a known terrorist escape, one who fired on a Starfleet vessel no less, Sisko has earned a Court Martial, and I don't know how I feel about it. I get that this is the frontier, and that morals are a bit grayer out here. But neither the friendship with Hudson nor the Maquis struggle had been sufficiently built up to justify this sort of grayness on Sisko's part. Kevin: Hudson had gone too far for Sisko to waffle. If they wanted to keep Sisko's loyalties divided, then so should Hudson's. I get why at the end when the option was let him go or kill him, he let him go. But a lot of the moralizing gets deflated by the fact they did blow up a ship with a crew that most almost certainly had no role or say in the ship's illegal actions. Hudson abetting the kidnapping of Dukat and shooting Sisko and the others to cover is too far for any moral gray area, even for a friend. Maybe Hudson could have been turning a blind eye to things, and that could have made Sisko's ambivalence more interesting. Matthew: Many of the various scenes in this plot were fun, despite my not feeling they added up to a coherently enjoyable whole. It's very cool that Nechayev was brought in to be the Starfleet presence, because it's a really cool note to previous TNG stories, the kind of thing that really pleases dedicated fans. I also loved the various Dukat scenes - his interrogation with the Vulcan was both funny and chilling, and his scene with Sisko upon learning he has been sold out by the Cardassians was really cool. It added a lot of shades to his character. I also like the idea of the "earth is a paradise speech," though some of the acting didn't do it for me. Kevin: My favorite scene in the two parter is Quark and Sakonna in the holding cell. It's a great moment when his pragmatism cuts through her rhetoric. That's a thread they never quite develop enough with the Maquis, who is looking to protect themselves and who is looking for revenge. It could have added the missing teeth to the Maquis story. The paradise speech was good for me, too, though I agree on the acting notes. I just wish we had seen some of the ruggedness the colonists are allegedly enduring. I mean, they have public replicators, and once you have lack scarcity, you gotta have a pretty sweet deal. Matthew: The guest cast was pretty good all around. Natalija Nogulich is consistently fun to watch, and bringing back John Schuck (the Klingon ambassador from ST4) as Legate Parn was a stroke of casting genius (though I'm unsure why he had to deliver his message personally, but whatever). We also saw the return of Groppler Zorn (sorry Michael Bell, but that's how you'll forever be known to me) as the weapons smuggler. His simpering was on target as usual. The Maquis extras were all pretty good, despite having precious little to do. Kevin: Nechayev is a favorite of mine for obvious reasons. I like that her attitude toward Sisko is even more harsh than Picard. He's a lower ranking officer and I don't get there's the sense they have any prior history together, so I like that there's not even an attempt at cordiality. I do love John Schuck's voice. It's the perfect threatening diplomat. Matthew: Marc Alaimo gets some juicy scenes in this episode, and it is all the better for it. He plays wounded very well when he discovers he is on the outs with Central Command. His reactions were slight and subtle, just like his character should be. But he's also great when jousting with his Vulcan interrogator and her more hot-headed Maquis companions. I wish he had been paired with Bernie Casey in a scene or two, personally. I think Casey is a good actor, though I know you found him a bit wooden, Kevin. Kevin: The way Dukat moved his jaw a fraction of an inch when he realizes he's been sold out was perfect. The underlying morality story about the Federation would have evaporated without Dukat there to drive it home and Alaimo did a good job. 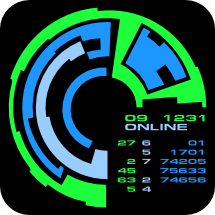 I think Casey did a good job, he just didn't quite get his hands around the universe, like when he read out the coordinates in the fight scene, spitting out each digit one at a time, it doesn't flow naturally the way that information is given out in other instances. It's the little shadings like that that make a character really inhabit the Trek world. Matthew: I didn't love Avery Brooks. I'm not saying I hated his performance, but I detected some teeth marks on the Paradise speech, and his character's waffling was somewhat off putting to me (this is just as much writing, though). Armin Shimerman was again great in a small role. He always seems to be at his best when his character is behind bars. Kevin: I have to say again that I loved Bertilla Damas as Sakonna. In the interrogation scene and the holding cell, she really read as a "Vulcan" as much as Saavik or Valeris. Her attempt to tamp down her own frustration read as natural and her cool dismissal of Dukat and the other Maquis' suggestion of harsher techniques was in keeping with the Vulcan character. I really like the way she managed to maintain a credible Vulcan character who believe differently than other Vulcans would be expected to. I wish she had been brought back on DS9, or even Voyager. Matthew: The dinner scene with Dukat was fun, as it gave us a chance to see a full spread of "alien" food (which usually consists of various crunchy vegetables, it seems). Kanar is gloppy now, though I think it is blue and clear in the very next episode. Differences in brewing or fermenting, I guess. Kevin: The changing kanar never bothered me. There's red, white, and sparkling, and we still call it "wine." Alaimo is a good prop actor. He wasn't just pushing it around the plate. It was fun to watch him actually tear into the meal. I always liked the kanar bottles. I wonder where they got them from. Matthew: Despite suffering from too few ships, the space battles looked neat, and I thought the ship design on the "fighter" was at least an interesting semi-departure for the franchise. They looked different, but not completely divorced from Federation technology. The Maquis hideout was a pretty standard soundstage set, nothing special. I liked Legate Parn's Fancy-Dan Cardassian outfit. It suited the character, and the actor's slight swishiness, quite well. Kevin: The Maquis ship spinning out looked great and the detail work on the runabout damage was also well done. The space-acting in the runabouts was good too. I got the sense everyone was really physically engaged in the fight. I also liked the interiors of the fighters. It was nice and cramped. The effect on Hudson's uniform destruction was a little sub-par for me. There have been better vaporizations. Matthew: Overall this is a 3 for me. I had some moderately-sized issues with the plot and characterization of Sisko, but the strong acting from the guest cast and some decent pew-pew-pew shots in space kept me reasonably entertained. Kevin: I agree with the 3, for a total of 6. I think this had potential, and it's certainly not "bad" by any stretch, but like Matt, I was reasonably to very entertained the entire time.